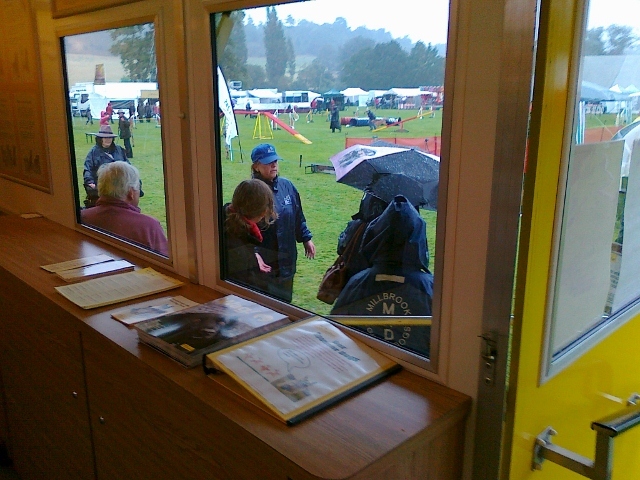 Mark from Harefield was helping me on the stand, as Laura my usual trusty colleague was having a well-earned rest. 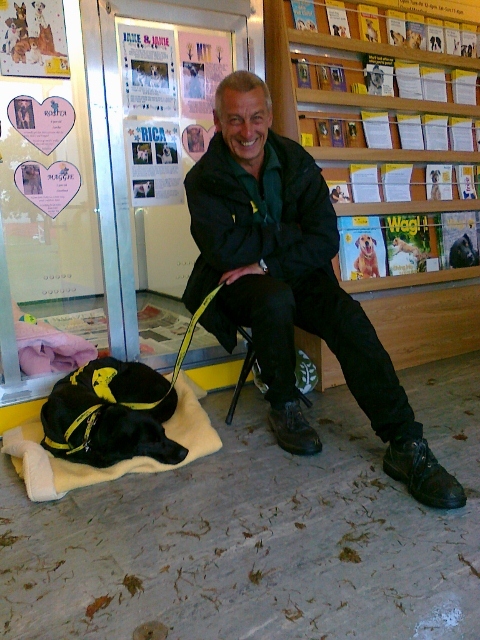 Mark had bought ‘Sybil’ a young Lab x Spaniel along for the day. She was beautiful, and she knew it. 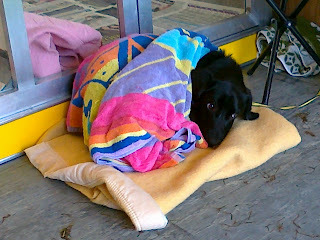 Unfortunately, because of the heavy rain, we didn’t have that many customers come and see us, so as you can see in the picture, she snuggled down on her blanket and went to sleep. (Still, we couldn’t have done too bad, because ‘Sybil’ had quite a few people go along to the Harefield centre afterwards to rehome her, and because of that, she has now found a lovely new home). We’ve also had an exciting time in Scotland for our West Calder centre near Edinburgh. Little did we know what the weather had in store for us up there!! We battled wind and rain on the journey up, only to arrive to hear the weather was going to get worse, with gales and torrential rain for the rest of the week!! ULP!! 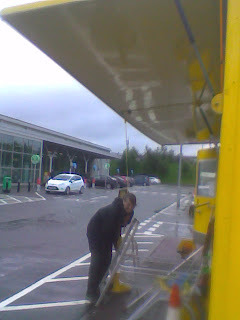 The most exciting time we had was when we had set up at Asda Newmains. It all started relatively ok. Yes the wind was quite strong, but nothing we hadn’t had before. We had a little break in the clouds from the rain, so Laura took the young dog we had on board out for a walk. All was still ok until Laura had been gone about a quarter of an hour, then all hell let loose. Suddenly the winds picked up at an alarming rate, and our canopy was whipping up and down to such a degree I had to rope it down. The wind didn’t ease at all, in fact it picked up speed and I was desperately trying to hold the canopy down as I couldn’t shut it up on my own because I’d have had to let go of the rope I was holding, and there was no way I was doing that. The gusts were lifting me of the floor as I desperately held on. It could only have been a few minutes before Laura came back, but that was enough thank you very much. The unit was swiftly closed. Phew!! I’ve not had that happen before, and quite frankly……I don’t fancy it again!! It was a little hair-raising (and feet raising) I can tell you…………..
Here’s hoping October is better! !